A warden took this photo of a snowmobile crash scene near Stacyville where a man was critically injured on Feb. 22. 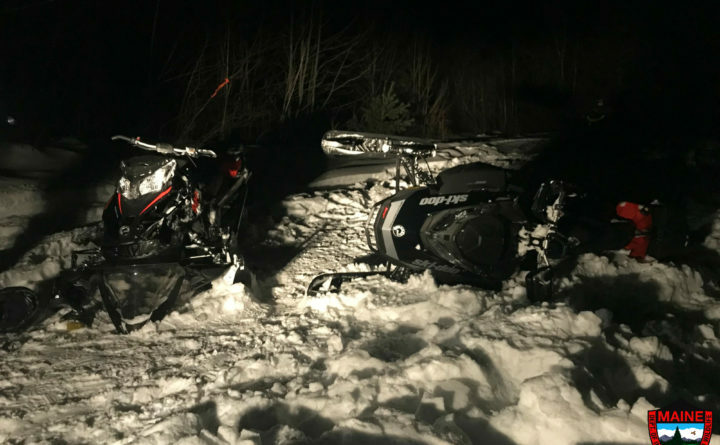 A Massachusetts man has died at a Bangor hospital after being critically injured Friday in a snowmobile crash in Penobscot County. Duane Carter, 55, of Spencer, Massachusetts, died Monday at Northern Light Eastern Maine Medical Center, according to Cpl. John MacDonald of the Maine Department of Inland Fisheries & Wildlife. On Friday evening, Carter was riding with others — including his friend Keith Sanford, 47, of Benedicta — on Interconnected Trail System 83, or ITS 83, a section of Swift Brook Road near Stacyville. During a curve in the trail, Carter’s snowmobile crashed into the the back of Sanford’s snowmobile. Carter was thrown from the 2016 Ski Doo, MacDonald said. Sanford and Carter were taken to Millinocket Hospital. Carter was then transferred to Northern Light EMMC, MacDonald said. It was the seventh fatal snowmobile crash this season, MacDonald said.